And of course, we can't leave out Gigli (2003), something beyond atrocious. If Affleck is honest with himself, he would call 2003 his Annis Horribilis: three films, three flops, three despised projects, just before two more flops/despised projects. A cursory look shows he hasn't made the best choices in front of the camera, especially when put against his partner in crime, the critically beloved Matt Damon. Then, he had an epiphany: he switched to directing a film, and the result was Gone Baby Gone, which, to the shock of everyone (including myself) was actually good. Damon may be the one getting the prestige projects (and made a successful franchise with the Bourne films), but he hasn't made someone a genuine star (Casey Affleck) or lead someone to an acting Oscar nomination (Amy Ryan for Best Supporting Actress). Now, Casey's elder brother has decided to expand his directing repertoire from his first film, about crime in Boston, with his second, a film about crime in Boston. This time, not only did he direct and co-write the screenplay (with Peter Craig and Gone Baby Gone co-writer Aaron Stockard) but decided to star in the film. Doug MacRay (Affleck) is the head of a group of thieves in Charlestown, just across the Charles River from Boston, Mass, proper. 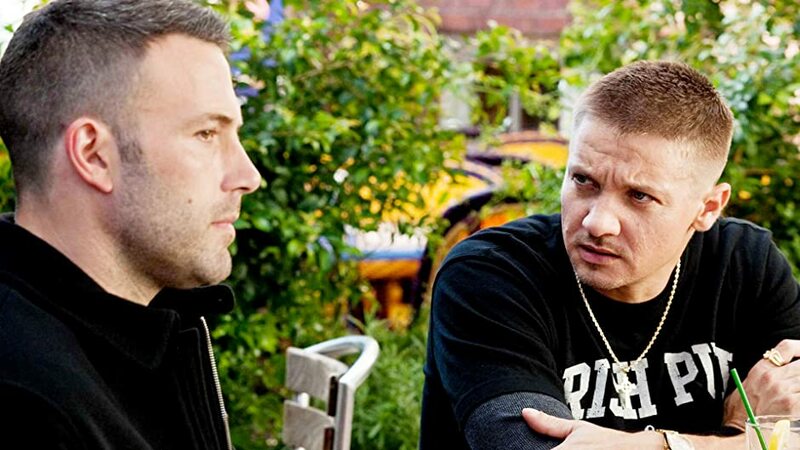 His crew consists of himself, his childhood friend/hothead Jem (Jeremy Renner), technical expert Desmond Elden (Owen Burke), and muscle Albert "Gloansey" Magloan (Slaine, who I understand is a Boston-area rapper). Their latest heist is successful, concluding with them taking the bank manager, Claire (Rebecca Hall) hostage, releasing her after they make their getaway. Jem discovers via her driver's license that she lives nearby to them and wants to take care of her, but Doug overrules him. Ostensibly to find out what she knows, he slowly befriends the unaware Claire, and soon they form a romantic relationship, which doesn't please Jem or Jem's sister Krista (Blake Lively), who has a daughter that may/may not be Doug's. Unbeknownst to either, FBI Agent Adam Frawley (Jon Hamm) is closing in on the gang. The thieves are at the beck and call of the neighborhood boss, Fergie the Florist, which has faint echoes of the Batman T.V. villain Louie the Lilac (Pete Postlethwaite) who forces him to take a most audacious robbery: none other than Fenway Park. The stories of the romance between Claire & Doug, the robbery itself, and Frawley's pursuit all collide at the legendary baseball park. 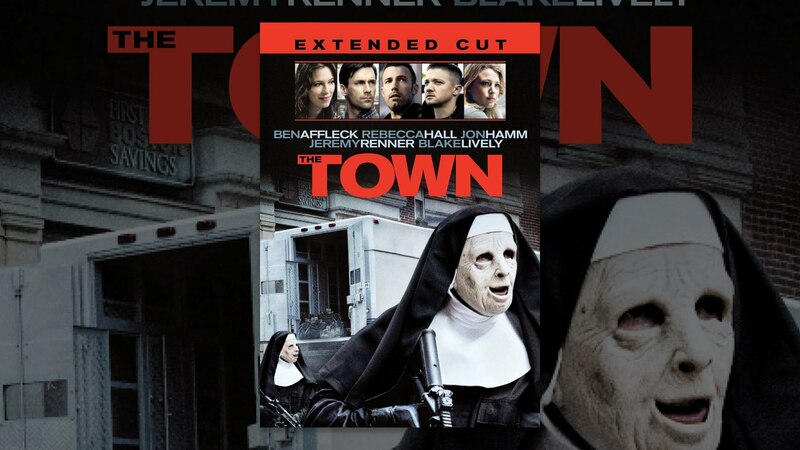 The Town shows us two things about Ben Affleck. Let's go to the first one: he is a strong director. The action sequences were fast and exciting, building on themselves to their climax. They even manage to have a bit of humor. The second robbery (that of an armored car where they're dressed as nuns), moves quickly to where you might begin to dodge the police cars, and then ends with a funny bit. The actual Fenway Park (or to quote them, Fenway Paah-k) heist is a tour de force of action (side note: the Boston accents were not as grating as I thought they would be and eventually your ear becomes accustomed to it, though the actors had varying degrees of success with that particular speech pattern). Even smaller scenes carry tension. Claire could identify one of the robbers via a Fighting Irish tattoo one of them had on the back of his neck. Later in the film, Jem shows up and catches Doug & Claire together. Doug knows what Claire saw, but Jem doesn't. How does he keep the two in the dark about the other? It isn't just the action scenes in which Affleck handles himself well. It's in the actual performances. At the top of the list of great acting in The Town is Renner, who has this volcanic fierce fury as Jem. This man is a live wire, full of anger, lover of violence, almost without a soul. It's a credit to his acting that he handles the Boston accent convincingly. His performance here shows that his nomination for The Hurt Locker was no fluke, and it would not surprise me if he scored another nomination in the Supporting Actor category for this film. Two other supporting parts deserve equal attention. Lively is one of the stars of Gossip Girl (which I admit I've never seen), but she shows that she is capable of being a strong dramatic actress. She has a small part in The Town, but her last scene where she realizes that Doug will not be with her and its aftermath are an incredible piece of acting that gets the tragic, self-loathing character so well (although her accent wasn't as strong as it could have been). While I have also never seen Mad Men, I know that Hamm here is as far away from Don Draper as he can get. Here, he's no smooth clotheshorse ladies man but a slightly disheveled detective who is determined to capture the criminals. Hall as the love interest/victim isn't the best performance in the film (the heartbreak/confusion/anger when she discovers the truth wasn't as good as it could have been), but overall it wasn't bad. Even the smaller roles like that of Postlethwaite and Chris Cooper (who had one scene as Doug's father) were good but in the case of the former at times appeared to border on comedy. 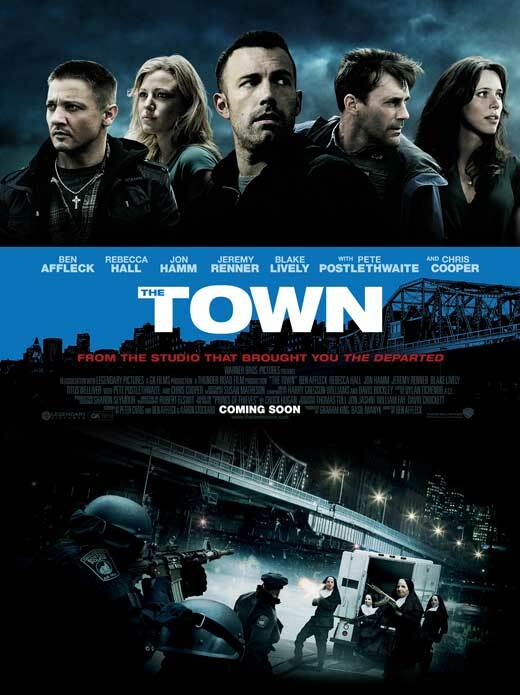 The second thing The Town shows about Ben Affleck is that he still is not a good actor. He does look older (and less beautiful) than he did in Pearl Harbor but his was oddly, the weakest performance in the film. Doug often would just look forlorn, almost blank, whenever he was with Claire. He couldn't quite bring himself to change his facial expression when discussing the pain of his mother's disappearance or when trying to convince Claire he truly loved her. It isn't that Affleck was expressionless: it was that it was the same expression throughout the film. He tried to act but whenever he shared the screen with Renner it was Jem we would look at, not Doug. There are some other problems with The Town. While Affleck did a good job directing the film, he couldn't get away from endless and repetitive shots of Charlestown/Boston. We were treated to a virtual tourism commercial for Beantown, and frankly that was both tiresome and cliché. Second, the story (based on Chuck Hogan's novel, Prince of Thieves) wasn't the most original material: you had the criminal with the heart of gold, the hothead sidekick, the idea that the lovers would run away, things we've seen before. We also had a most ambiguous ending which proved unsatisfying. Sometimes the audience reaction was laughter when there shouldn't have been. When a child observes the robbers as nuns approach the armored car in slow-motion the audience laughed. When Fergie the Florist gets his due (again in slow-motion) the audience laughed (and the slow-motion, yes, clichéd). Finally, we had a montage of Affleck exercising, and while it's nice to see that at 38 he still has abs to show off the montage did smack of self-adulation that was frankly gratuitous. Thanks for showing us you're still buff, Ben. Now show us your acting muscles. Ben Affleck has a solid career as a director. Right now he's hampered by the fact that both his films are Boston-centered crime dramas. It would be interesting if Affleck tried something radically different (a costume comedy, perhaps). As an actor, he's a very good director. It is the performances of Hamm, Lively, and especially Renner that elevate the film to a higher quality, along with good action sequences. Overall, The Town is a nice place to visit but I wouldn't want to linger there.